Standards-based grading (SBG) is an innovation in education that focuses on learning and helps increase achievement. It is often combined with updated instructional practices and culture to better engage students and foster a positive environment. This page is an introduction for parents and educators new to standards-based education. Traditionally teachers focus on teaching, the attempt to deliver knowledge. In SBG they also measure student learning, to understand the effectiveness of instruction. Instead of a single overall grade, SBG breaks down the subject matter into smaller “learning targets.” Each target is a teachable concept that students should master by the end of the course. Throughout the term, student learning on each target is recorded. Teachers track student progress, give appropriate feedback, and adapt instruction to meet student needs. 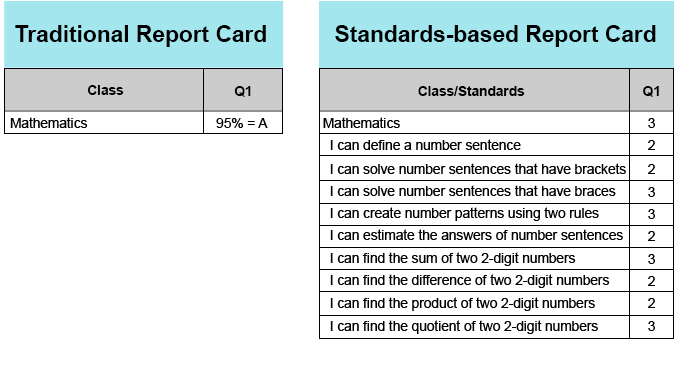 Figure 1 shows example report cards that highlight the differences between traditional and SBG. Traditional grading and SBG also use different grading scales. In traditional grading, students are primarily measured by the percentage of work successfully completed. The assumption is that higher completion rates reflect greater mastery, and earn higher grades. Often 90% achieves an A, 80% a B, etc. In SBG, grading is based on demonstration of mastery. Students attempt standards-aligned activities (projects, worksheets, quizzes, essays, presentations, etc.). Teachers assess the student output and choose the appropriate mastery level that was demonstrated. Typical scales are 1-4 and reflect students’ increasing skill. 1's indicate that students have little understanding of a concept, and consequently cannot demonstrate any mastery. When starting a new target, many students have no prior knowledge, and begin at 1. As students learn, they can demonstrate partial mastery, and score 2. Once they meet a target, they score 3. Typically 4's are used for students who exceed targets. Figure 2 shows example traditional and SBG grading scales. Note: Even though 1-4 is popular, SBG grading scales vary widely. Scales can be 1-5, 0-4, use half points, and use letters instead of numbers. Yours may be different. In standards-based education, teaching is responsive to learning. When starting a new target, teachers present introductory lessons. As students progress, they are offered more complex material. They continue working and learning until they reach the target. Think of SBG as a ladder, where students climb up, “a rung at a time,” eventually reaching the top. 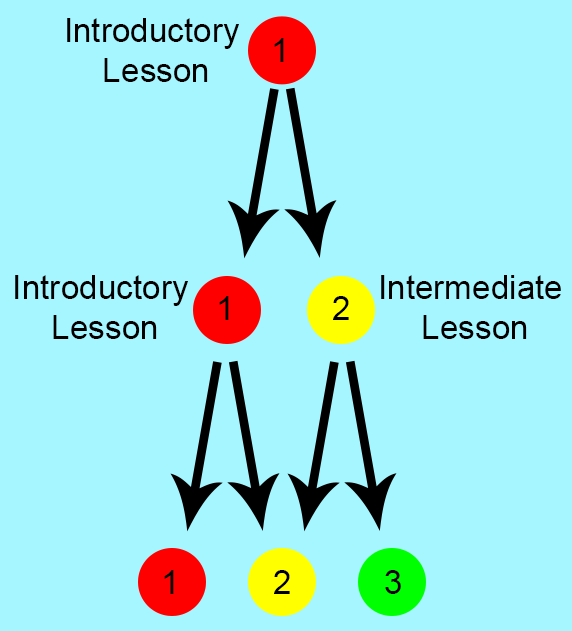 After receiving instruction, some students progress immediately, but most do not. It’s common for students to be confused, and only partially complete an activity. Teachers regularly provide feedback, reteach, and offer additional opportunities to reach “the next rung.” This process requires patience and practice, and is repeated until students reach the target. SBG is powerful because it provides a framework to regularly measure student progress. When teachers have continuous understanding of students’ mastery, they can adapt instruction to better meet students’ needs. This causes education to be more effective and engaging. Now that we’ve described the mechanics of SBG, let's look at the advantages standards-based education brings to the classroom. Many instructional changes improve student engagement and learning. In SBG environments, better feedback accelerates learning. Instead of simply giving scores like 9/10 or 85%, teachers give feedback about the task performed and skills used. This helps students understand their current areas of improvement, and helps them reach the next level. This positive environment speeds learning and students reach higher levels of achievement -- all while being deeply engaged and enjoying school. 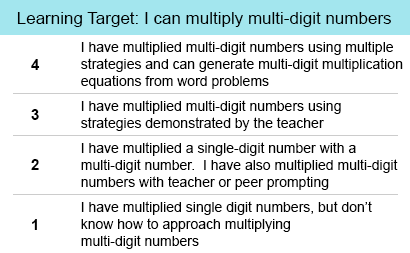 Learning targets are typically written in student-friendly language, so they can understand the goals of instruction. Targets may be further broken down by rubrics to map out the steps required to reach the "top of the ladder.” This allows students to understand the path to success, and enables them to better engage in their learning. When working on an activity, they can self-assess and reflect on their own performance. They can identify areas of improvement and self-direct their activities. This leads to greater ownership of their learning. A typical rubric is shown in Figure 6. In traditional classrooms, many teachers mechanically present curriculum to students -- lesson 1 on day 1, lesson 2 on day 2, etc. While there are exceptions (e.g. - early elementary reading), often there is little adjustment to instruction due to learning. Because students learn at different rates, some are bored because the pace is too slow. Others are confused because instruction is too fast. This is a daily challenge in traditional classrooms. In SBG classrooms, teachers better understand student mastery. At any time, they know which students are at level 1, 2, or 3. This helps teachers offer level-appropriate work. 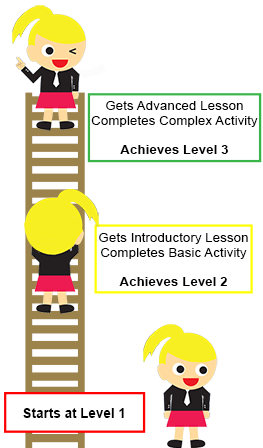 Students at level 1 get activities that help them reach level 2. Level 2 students get activities to climb to level 3. Classrooms often break into smaller groups with students working independently on level-appropriate activities. This is called "differentiated instruction," or DI for short. In this environment, students are less frustrated by poorly-fitting instruction. School is a more positive experience when course material is relevant and interesting. By improving the use of instructional time, students learn more and make increased academic progress. Some students may be extrinsically motivated by metrics, and strive to improve in measured areas. In traditional classrooms, this often encourages students to “chase points.” Many will perform tasks that award points and raise their averages (e.g. - extra credit). Conversely, it’s common to hear students ask, “Will this be graded?” They often will skip any activity not entered into the gradebook, regardless of merit. This creates unhealthy incentives which skew student behavior and attitudes. In SBG, the focus is on learning and mastery. Striving for mastery is an intrinsic motivator and transforms student attitudes. They learn for their own enjoyment and sustain high levels of effort and achievement. At the beginning of each marking period, students start with 100%. Their averages fall as they make mistakes. Students with the fewest mistakes earn the highest grades. Depending on the size of the mistake (e.g. - a zero), it may be impossible to recover and earn a “good grade.” This high-stakes environment can create test-taking fear and cause anxiety, which interferes with learning. In SBG, scores go up as students learn. Final grades are reflective of mastery at the end of the course, so there’s little penalty for early mistakes. No event can “ruin” their grade. This creates an emotionally safe environment where students are encouraged to stretch themselves, make mistakes, and learn. While SBG removes the problem of zeros, it's also common for organizations to allow redo's. When a student gets a poor score, they can often work more on the topic, increasing their learning, and reassess. The ability to reach mastery is celebrated versus the focus on the number of mistakes made along the way. One pitfall of traditional grading is inaccuracy. Student averages are highly dependent on the difficulty of work assigned. If teachers present only low complexity activities, students can earn high scores with only a weak command of the material. The opposite is also true. Highly demanding instructors may present very difficult work, resulting in overly low student scores. Curving and extra credit are used to adjust averages into more appropriate distributions. In both cases SBG can improve the situation by providing clearer criteria for measuring mastery. Mastery of low complexity work yields lower grades while mastery of higher complexity work provides higher grades. 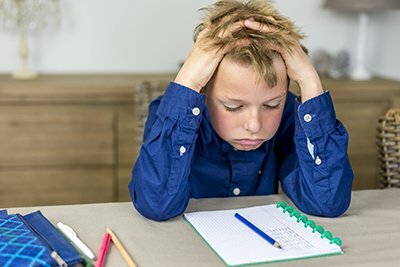 Connecting grades to complexity rather than percentage completion yields more accurate and consistent grades. This document was written by the team that produces TeacherEase, software for standards-based learning. We believe that successful SBG requires good technology, so we built TeacherEase to meet this need. It includes all the tools necessary: committee collaboration, learning targets, rubrics, assessments, instructional content management, data analytics, gradebook, report cards, and parent portal. For more information, check out: TeacherEase: Software for Standards-based Learning. For more information, we recommend the SBG-related videos below.